Fabrication of high performance, multi-layered phosphorescent organic light-emitting diodes (PhOLEDs) is often done by vacuum deposition of small organic molecules which can be a lengthy and costly process. Solution processing (layers can either be coated or printed from solution) is a more viable technique in terms of cost. However when it is used to make multilayered devices the lower layer can be affected by the solvent from upper layers due to inter-miscibility. It would be better to have electron and hole transporter materials together in a single layered device. 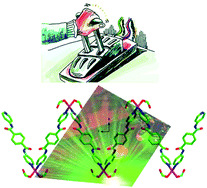 Yan Huang, Zhiyun Lu and colleagues have reported two novel orange iridium(III) complexes. The complexes were synthesized by modifying the phenyl moiety of the parent complex, (bt)2Ir(acac) (bt = phenylbenzothiazole, acac = acetylacetonate). The new complexes have good thermostability and film amorphism meaning that they were able to be tested in a solution-processed single layer PhOLED. Both complexes demonstrated higher luminescence and efficiency than the parent complex. The improved characteristics of the two new Ir(III) complexes mean that they are promising candidates for use in low cost fabrication of PhOLEDs for large area displays. N-heterocyclic carbenes are neutral σ donors and electron rich, making them attractive for use as ligands in transition metal catalysts. By changing the nature of the azole ring (nitrogen heterocycle containing at least one other atom of S, N or O) and the substituents, the electronic and steric properties can be modified. Studies of expanded NHCs containing a 6- or 7-membered ring have only recently started to appear in the literature. 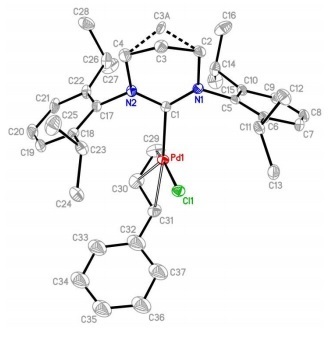 This includes that of Nechaev and colleagues who have synthesized a series of new 6- and 7-membered NHC palladium complexes. Kolychev and Nechaev screened the complexes as catalysts for Suzuki-Miyaura cross-coupling of heteroaryl chlorides and bromides. They tested the catalysts using ‘green‘ reaction conditions and showed that reaction products are clean with no homo coupling products formed. Fluorides of aluminium are used in the aluminium industry and also as catalysts for ozone friendly alternatives to chlorofluorocarbons (CFC’s). Previously, crystal structures of some fluoroaluminate anions have been solved by the introduction of either organic or metal cations. But until now, the crystal structure of a particular fluoroaluminate anion, the bioctahedral Al2F93- anion had not been reported. The Al2F93- anion has two octahedral AlF6 units which are face-sharing and has D3h symmetry. The current issue of Dalton Transactions is a themed issue on boranes and borohydrides, of which one of the cover articles by Chunfang Jiang and Douglas W. Stephan explores phosphinimine-boranes in frustrated Lewis pair chemistry. Frustrated Lewis pairs are entities that consist of a Lewis acid and a Lewis base which, because of sterics, do not form an adduct. These systems are very reactive and are able to activate H2, CO2, and olefins amongst others without the need for a transition metal catalyst. In this article, a series of phosphinimines (species contanining a phosphorous-nitrogen double bond) were combined with B(C6F5)3 and in one case a Lewis acid-base adduct was formed. The reactivity of the adduct was compared to the other cases where frustrated Lewis pairs were generated. Remarkably, the researchers discovered that both the adduct and the frustrated Lewis pairs were able to activate H2, CO2 and phenylacetylene. This work paves the way for discovering even more acid base combinations that could be used in frustrated Lewis pair systems for catalysis without the need for transition metals. Commercial Lithium ion batteries (LIBs) usually contain graphitic anode materials but their relatively low capacity means that they can’t be used for high capacity storage applications such as electric vehicles and aerospace transport. Alternative anode materials with higher specific capacities have been studied such as metal oxides and metal sulfides. One dimensional structured metal sulfides in particular have received significant research interest but during charge–discharge experiments, the metal sulfides suffer from volume expansion, limiting their cycling performance. To overcome this issue, researchers have tried combining metal sulfides and conductive carbon based materials. With this in mind, Yaunzhe Piao and team have successfully made a 1D structured carbon nanotube – MoS2 (CNTs-MoS2) hybrid nanomaterial using an environmentally friendly synthetic procedure. The synthesis did not require any surfactants or harmful solvents but used a hydrothermal method with the amino acid, L-cysteine which helped the MoS2 nanosheets to bind to the CNTs. The hybrid material has a higher specific capacity than just MoS2 or CNTs and even has a high specific capacity after 30 charge–discharge cycles. The synthetic approach towards MoS2-CNTs could be applied to other metal sulfides to explore their electrochemical properties. In recent years, metal organic frameworks (MOFs) have received a great deal of research interest due to their application for gas storage, catalysis and for use as sensors. By choosing different metals and organic linkers, the pore shape and size can be tuned for one’s particular need. In this article, Yue-ying Ching and colleagues have reported a MOF which has green persistent luminescence. To the researchers’ knowledge, persistent luminescence has not been reported in MOF’s before. The luminescence lasts for about 1 second which means that this material can be classed as a long lasting phosphor (LLP). LLPs have decay times of seconds, minutes and in some cases hours making them useful for LEDs and emergency lighting, amongst others. The preparation of conventional LLPs requires extreme reaction conditions (temperatures of at least 1000﻿﻿ºC!). This new MOF was synthesized using solvothermal conditions at 115﻿ºC. This work provides an exciting new route towards LLPs, without the need for co-dopants or extreme synthesis conditions. To find out more, download the article now…. Feng Luo, Gong-Ming Sun, An-min Zheng, Shi-xun Lian, Ying-liang Liu, Xue Feng Feng and Yue-ying Chu. When metal nanoparticles are used as catalysts, they can have a tendency to aggregate. Especially when the metal nanoparticles (NPs) are not functionalized as there isn’t anything to oppose the Van der Waals forces. Aggregation or coalescence of the NPs can lead to a decrease in catalytic activity. Two strategies have been developed for stabilisation — addition of a ligand post NP synthesis or inclusion of a coordinating ligand into the cation of an ionic liquid (IL). In a previous Dalton Transactions article, (Dalton Trans., 2011, 40, 4660–4668) the stability of ruthenium nanoparticles (RuNPs) was improved by the combination of ILs and stabilising ligands to produce a recyclable catalytic system for the hydrogenation of toluene. In this new article, Agilio Padua and colleagues have taken this one step further and investigated the effect of various ligands on the catalytic activity of RuNPs in an IL. RuNPs were prepared in an IL, and in the presence and absence of a series of different ligands. Padua and colleagues discover that the activity of RuNPs with respect to the catalytic hydrogenation of cyclohexadiene, styrene and limonene increased with σ-donor ligands (water and octylamine) but decreased with π-acceptor ligands (carbon monoxide, phenylphosphine and diphenylphosphine). This paper demonstrates how RuNPs as catalysts are remarkably similar to homogenous catalysts in that their activity and selectivity can be controlled by σ-donor and π-acceptor ligands. Cyanide compounds can be highly toxic as the cyanide anion inhibits an enzyme in the electron transport chain, cytochrome c oxidase. The inhibition of this enzyme means that cells in the body can no longer produce ATP aerobically for energy which can eventually affect the heart and the central nervous system. Some industrial processes such as gold mining make use of cyanide ions and the accidental release of these ions can cause serious problems. The potassium salt of cyanide is also used as a terror chemical agent. As such, there is a need for more efficicent detection of cyanide ions with lower detection limits than methods which have been used previously. Manoj Kumar and his team at Guru Nanak Dev University, India have synthesized a triazole ( five membered ring with 3 nitrogen and 2 carbon atoms) modified triphenylene (four fused benzene rings) which can selectively complex copper2+ ions. The triphenylene based copper ensemble was shown using UV-vis and fluorescence spectroscopy to give a selective response for cyanide ions, even in the presence of blood serum and bovine serum albumin. This paper highlights the potential versatility of the copper ensemble for cyanide detection in different environments. To read more about the detection of sodium cyanide in tap water and solid state detection of cyanide using the copper ensemble read the full article. The big challenge in hydrogen storage materials research is to develop materials that have a high storage capacity, are fully reversible, and can operate at ambient temperature and pressure. Our group have previously reported chromium hydrazide gels that store hydrogen via the Kubas interaction. The material has a gravimetric hydrogen storage performance of 3.2 wt% at 298K which corresponds to a volumetric capacity of 40.8 kg H2/m3, meeting the US Department of Energy’s 2015 target for volumetric density (40 kg/m3). In this latest Dalton Transactions article, the Cr(II) binding sites were studied computationally to further study the interaction with H2. Strong evidence suggests that the metal-H2 interaction is Kubas type (confirming our previously reported results) – the Kubas interaction between a transition metal and H2 involves σ-donation from the filled H‑H σ-bonding orbital into an empty transition metal d orbital, and is strengthened by back-donation from a filled metal d orbital into the vacant σ* orbital of the H2 molecule. The binding model is similar to the Dewar-Chatt-Duncanson model for the bonding of CO ligands to transition metals. Kaltsoyannis and team extended the system to incorporate other transition metal binding sites: Ti(II), V(II) and Mn(II). They found that H2 did not bind to Mn(II) suggesting that Mn(II) materials may not perform well for hydrogen storage. Hydrogen did bind to V(II) and Ti(II) and calculations indicate 5 and 7 wt% gravimetric storage respectively, surpassing the DOE’s goal for gravimetric storage. This paper shows that materials based on V(II) and Ti(II) could potentially perform better than the experimentally-realised chromium hydrazide gels.